Here’s a challenge. Can you find any significant work of English literature for the period from 1840 to 1940 that was not published as a Tauchnitz Edition, or for the later period, as an Albatross Edition? I can offer two as a starter. Although the Tauchnitz series includes most of George Eliot’s work, the firm did not publish ‘Middlemarch’, which appeared instead in the rival ‘Asher’s’ series. It similarly missed out on R. D. Blackmore’s ‘Lorna Doone’. Beyond those two, it’s difficult to think of many significant novels that are not included. It’s worth remembering in this respect that Tauchnitz was not a series of classic editions, chosen several years after first publication, with the benefit of hindsight. 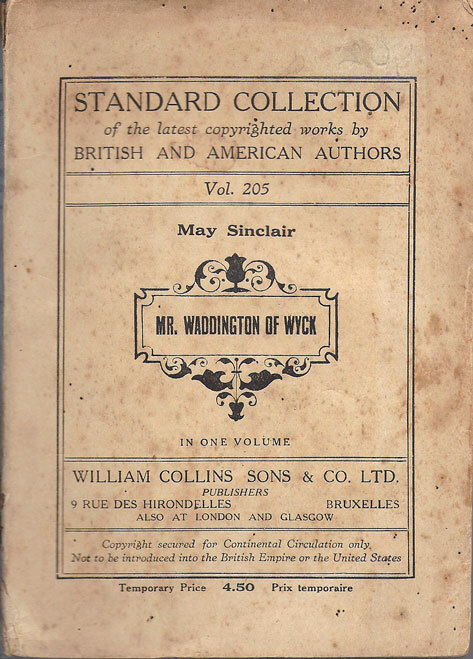 It published contemporary literature, usually more or less simultaneously with the first UK or American edition. That of course included many novels that are little remembered now, but its track record of spotting emerging, as well as established, talent over many years was impressive, particularly given that it had to do so from a distance. Its success was not for lack of competitors. 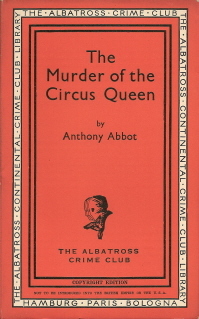 By one count, recorded in the 1937 Tauchnitz centenary publication, Albatross was the forty-third known rival for Tauchnitz. Many of these competitors were designed to look very similar to Tauchnitz, and offered generous royalties to tempt authors away from the firm. For the most part though, their lists contain few novels of enduring literary merit. 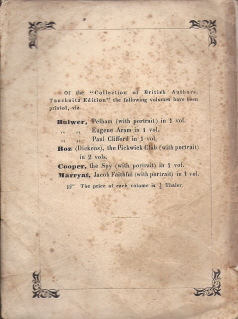 The ‘Asher’s Collection of English Authors’, launched in the early 1870s, was one of the more successful, briefly tempting away many of Tauchnitz’s established authors. The enforced absence of Tauchnitz from the market during World War I then offered a chance to two other publishers - Nelson’s Continental Library and the ‘Standard Collection of British and American Authors’. 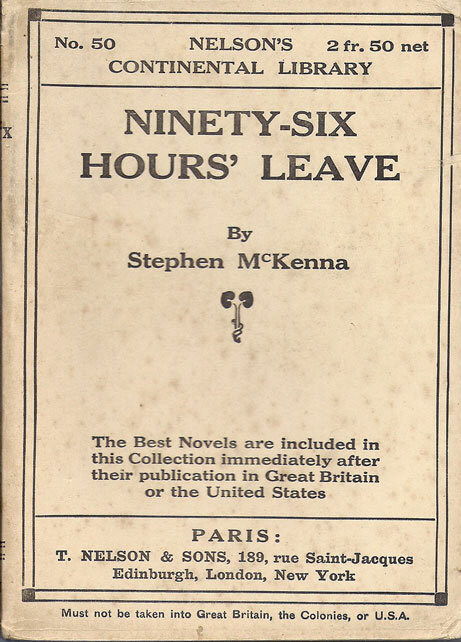 Neither made much of a mark on literary history, although Tauchnitz would certainly have been disappointed to miss out on ‘The thirty-nine steps’, amongst other titles published by Nelson. By the late 1920s though, Tauchnitz was trading on its reputation and its list of established authors, and was not showing the same ability to identify and sign up new authors. With the launch of Albatross in 1932, the handful of major works that Tauchnitz had missed out on in earlier years suddenly threatened to become a flood. 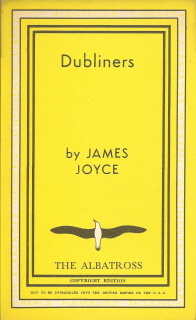 In 1932 and 1933 alone, the Albatross list included ‘Ulysses’ and ‘Dubliners’, ‘The waves’ and ‘To the lighthouse’, ‘Lady Chatterley’s Lover’, ‘The garden party’, ‘Brave New World’, ‘The Wind in the Willows’, ‘The Maltese falcon’ and a host of other works that have become part of the culture. As well as the works of these authors, they also published in the same two years, work by Sinclair Lewis, A.A. Milne, Edgar Wallace, Rosamond Lehmann, Hilaire Belloc, Ellery Queen, Evelyn Waugh, Eugene O’Neill, Edith Wharton and Agatha Christie. In earlier days, Tauchnitz would have been disappointed to miss out on any one of those novels, or of those authors. By 1934, the contest was over and the effective takeover of Tauchnitz by Albatross was completed. The two series ran side by side for the few years remaining before the Second World War, and as a result, we can now look at the Tauchnitz and Albatross series together, and the challenge remains. Are there any other significant works of English literature from 1840 to 1940 that are not included in one or other series? 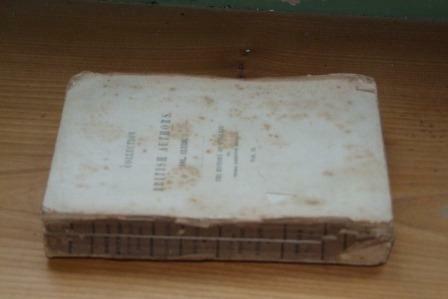 The early Tauchnitz paperbacks from 1842 are now 170 years old, and naturally few have survived. 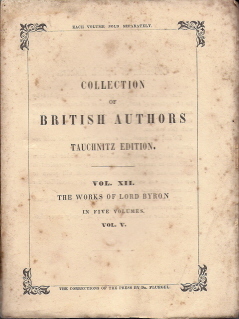 The earliest paperback copy found by Todd & Bowden in any of the collections they examined, seems to be a copy of volume 12, the last of the series of 5 volumes of Byron’s poetry issued as volumes 8 to 12 of the series. 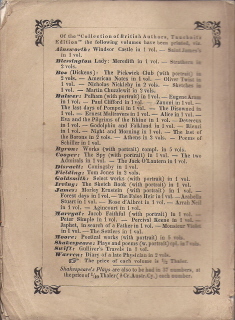 They note that this has a list up to volume 21 (published in October 1842) on the back cover, and conclude that it is a later issue. My guess is that it is in fact a first printing. Although it’s difficult to work out precise dates, it’s clear that the 5 volumes of Byron were not published simultaneously, nor were they all published ahead of later numbered volumes. According to the dates in Todd & Bowden, notice of publication of volume 8 was given in April 1842, of volume 9 in June, volume 10 in July and volume 11 in September. 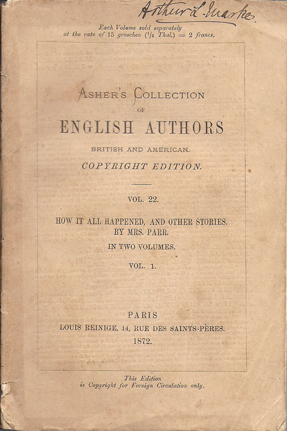 Although no date is given for volume 12, it seems reasonable to guess that it may have been in October, which would make it natural that the first printing would include details of Volumes 1 to 21. I have similar copies of volume 9 (listing up to vol. 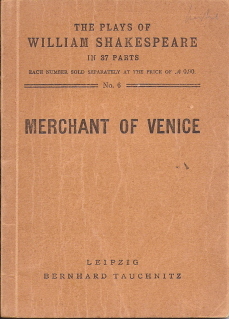 15), volume 10 (listing up to 19), and volumes 11 and 12 (listing up to 21). It’s possible that all may be in the earliest state. I also have copies though of two even earlier paperbacks, volumes 4 and 7, each listing 7 volumes on the back cover. That makes it likely that volume 7 is in the earliest state, but volume 4 may not be. 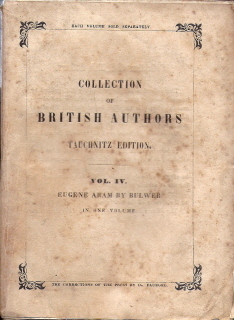 Publication of this volume was announced at the end of December 1841, with volume 7 not announced until February 1842. There’s another mystery here though. 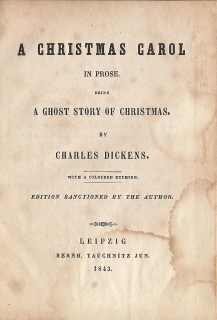 Although the first volume of the series was announced as early as September 1841, the date on the title page for all the early editions (up to volume 32) is 1842. 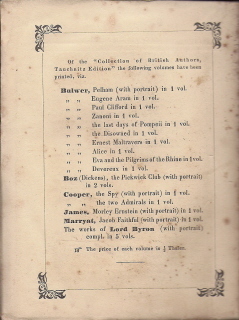 Is it possible that in practice, none of the volumes were issued until early 1842, in which case volumes 1 to 7 may have been listed on the back cover of all the first 7 volumes? There doesn’t appear to have been any practice in later years of using the following year’s date on books published at the end of the year. All of the early paperbacks that I have seen are in the state that Todd & Bowden classify as w1b. They speculate that an earlier printing state may exist (w1a) for volumes 1 to 6, which would not refer to ‘corrections of the press by Dr. Fluegel’ on the front wrapper. However neither they nor I have ever found a copy in this state, or any copy listing fewer than 7 volumes on the back wrapper. The only way to prove or disprove it, would be to find such a copy. I would love to hear from anyone who has one! The first thing to say in Part II of this blog is that Part I was complete nonsense. None of it made any sense because the only thing that determines the value of a second-hand book is supply and demand. A book is only worth what someone else is prepared to pay for it. The unfortunate truth is that there are many old books that almost nobody wants to buy. There are even many old, rare, beautifully bound, and fine condition books that nobody wants to buy; a fact that is profoundly shocking to many book dealers. In particular, there are many Tauchnitz Editions that nobody wants to buy. Although quite a few libraries hold Tauchnitz collections, I am not aware of any that are actively seeking to add to them, and the number of private collectors can be counted on the fingers of one hand, without getting much beyond the thumb. In practice most collectors are interested in the books of a particular author, or sometimes a particular genre, rather than a particular publisher, so demand for a book tends to be determined by how ‘collected’ the author is. What influences this is beyond me, but some authors are far more collected than others and of course many are not collected at all. So demand for a particular book can vary enormously and so of course can supply. Some books had bigger print runs than others, and the probabilities of survival vary too, with the books of ‘literary’ authors generally more likely to survive. What this means is that the value of Tauchnitz Editions is potentially far more variable than suggested in Part I, according to the particular author and the particular book. Only an experienced book dealer can judge this, and even then most will have only partial knowledge of the market. It’s not difficult to see that ‘Pride and Prejudice’ and ‘A Christmas Carol’ are particularly sought after (significantly more than other works of Austen or Dickens), but much more difficult to know which of Mrs. Braddon’s novels are the rarest or the most collected. One that's in high demand. On the other hand many Victorian authors are now very unfashionable and hardly collected at all, in which case there may be simply no potential purchasers, at almost any price. I don’t think Bulwer Lytton or G.P.R. James have many fans these days, although I’d be delighted to be proved wrong. So values of old books are determined by supply and demand, and only experienced book dealers can hope to have a real understanding of how supply and demand interact for a particular book. Does that mean that the thousands of Tauchnitz Editions offered for sale on the internet are all realistically priced by dealers with a clear understanding of the market? Of course it doesn’t, partly because few dealers have any significant knowledge of this obscure corner of the market, partly because many dealers are incurable optimists, and partly also for technical reasons to do with what I call ‘survivor bias’. This is the influence that comes from the internet showing only the prices of books that have failed to sell, with no record of what prices books actually sell at. Surely there is an opening here for someone in the industry (ABE springs to mind) to make available in a searchable format, the prices of books that have actually sold. The pricing of books at a level where they have a realistic chance of selling is in everybody’s interests. In the meantime, my own opinion is that many Tauchnitz Editions offered for sale on the internet are over-priced, at levels where they are very unlikely to sell. The only sensible strategy for a dealer faced with books that have been unsold for years is to reduce the price. I’d suggest a 10% reduction every year, either until they sell, or until it’s clear that they’re only fit for pulping. Here’s one possible way to put a rough value on a Tauchnitz Edition. First take the approximate date the book was produced – not the date shown on the title page, but the actual printing or production date. For paperbacks this is often, but not always, shown at the top of the back cover. For hard bound copies it’s more difficult to determine, but it can’t be earlier than the date on the title page and it may be much later. Often the best way to judge is by the style and quality of the binding. Anyway let’s assume we can work out roughly which decade the book comes from. If it’s from the 1850s or earlier, we start at £10, for the 1860s - £9, 1870s - £8, 1880s - £7, 1890s - £6, 1900s - £5, 1910s - £4, 1920s - £3, 1930s - £2 or post WWII - £1. The next question then is whether it’s a first printing – again very difficult to judge without the bibliography, but If you can be confident the book is a first printing, then double this value. The value can also be significantly increased by a fine binding – leather spine and corners, titles in gilt, raised bands on the spine, page edges gilt or marbled, nice endpapers, sewn-in bookmark etc. It’s hard to say exactly what qualifies as a fine binding, but maybe easier to recognise one when you see it. If you’d describe it as a fine binding, add 50%. A nice binding ........ and a not so nice one! That though brings us on to condition. If it’s in poor general condition, with grubby or dog-eared pages, a binding that’s coming to pieces, pages torn or bits missing, etc., then take off 80% of its value. Generally good condition but with significant page browning or spotting or other marks of damp or stains, or minor insect damage, will still mean a much reduced value, but maybe only 50% off. For ex-library markings take 50% off, and the same for a missing half-title page on a bound copy. Condition often reduces value, given that most old books have significant faults, but it can also enhance it, so if the condition is really exceptional for a book of its age, then add 20%. Next we need to allow for multiple volumes of the same book. 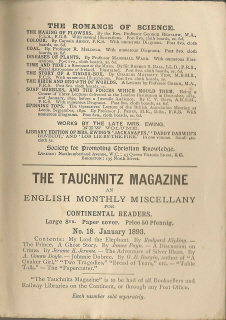 Tauchnitz issued many books in two volumes, and a smaller number in three or more volumes. If not all volumes of a book are present, reduce the value by 80%. If there are two volumes and both are present, the combined value may be 50% more than for a one-volume book, or 100% more if there are three volumes. This broadly applies whether the volumes are separate, or are bound together in a single binding. So for a paperback the value might range from £20 or so for an early 1st printing in very good condition, to only a few pence for a poor condition reprint from the 1930s. 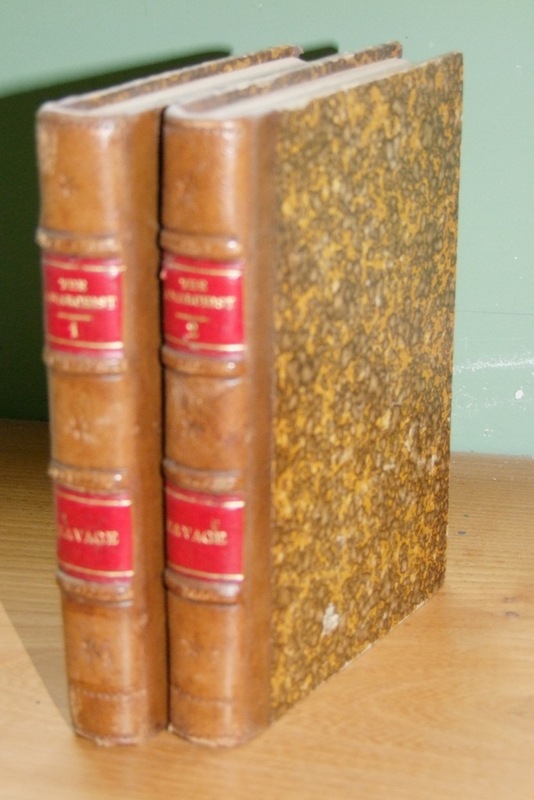 A 19th century two-volume novel in a fine binding, in excellent condition and in the first printing state could potentially be worth £40, while a 20th century single volume in a reasonable plain cloth binding might be more like £10 if it’s a first printing and a lot less for a reprint. All of this though ignores the most important element in pricing or valuing a book, so that’s what I’ll look at in part II. The bicentenary of Charles Dickens, born 200 years ago this month, is certainly an occasion to celebrate, and also to remember the remarkable and longstanding relationship he had with Bernhard Tauchnitz. It is not yet Tauchnitz’s own bicentenary; he was not born until 1816, but the two men were roughly the same age and their careers developed over the same period. 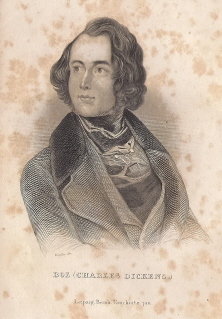 At the time they signed their initial agreement in 1843, authorising continental publication of Dickens’ work, Tauchnitz was just 27 and Dickens, although already an exceptionally successful novelist, was 31. They remained friends as well as business partners until Dickens’ death in 1870, and the friendship extended to their families. 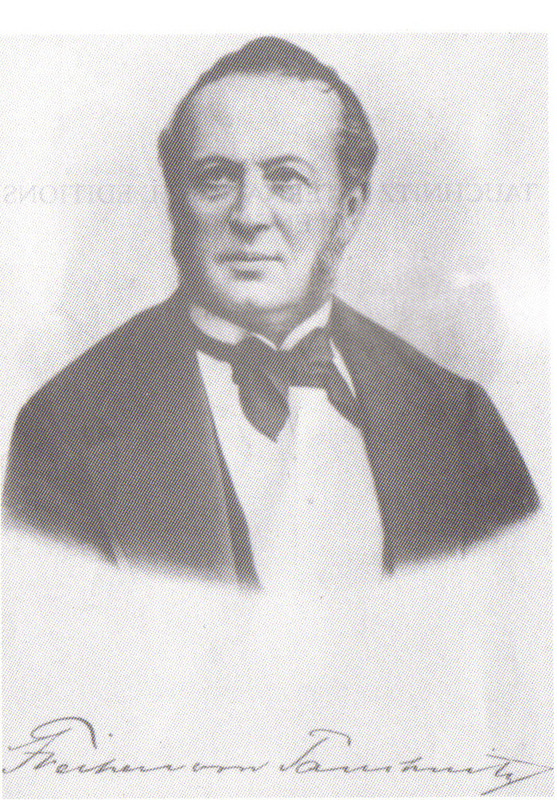 The following extract from a letter of 1856 shows some of the depth of the relationship: “Having thus disposed of business, let me have the pleasure of adding that we all unite in kindest regards to Mrs. Tauchnitz and your family, and that we shall all remember our meeting here with great pleasure, and shall always look forward to a renewal of that friendship – somewhere”. To mark the bicentenary, I have added a Dickens page to the website, and I also aim to offer a small selection of Tauchnitz editions of Dickens for sale, with a full bibliographical description. It’s certainly possible to find other copies available for sale on the internet, but few of them are accurately described, many are wrongly identified as first printings, and as a result, many are overpriced. Hopefully I can avoid at least some of those errors. In a separate blog on my Services Edition site, I recently speculated about whether books have a half-life. In other words, does exponential decay apply to the number of remaining copies of the first printing of a book? If 10,000 copies are printed and after 20 years there are 5,000 left, is it reasonable to expect the number remaining to halve every 20 years? Can we judge what the half-life might be by estimating the number of remaining copies? Could we even use it to predict how many might remain in future? 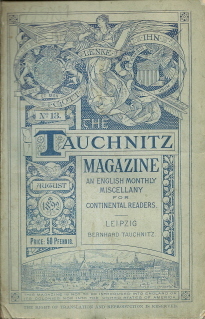 First printings of Tauchnitz Editions had relatively low print runs, possibly 1,000 – 2,000. Those that sold successfully would be re-printed many times, accumulating sales of many thousands, even tens of thousands, but I doubt the initial print runs were much higher than one or two thousand. For the most part they were printed as paperbacks, although on reasonably good quality paper, and a significant proportion of 19th century books were subsequently bound privately. Once bound, their half-life would clearly be longer, but they also become less easily distinguishable as first printings, making it difficult to estimate how many of the first printing remain. So let’s first concentrate on the paperbacks. 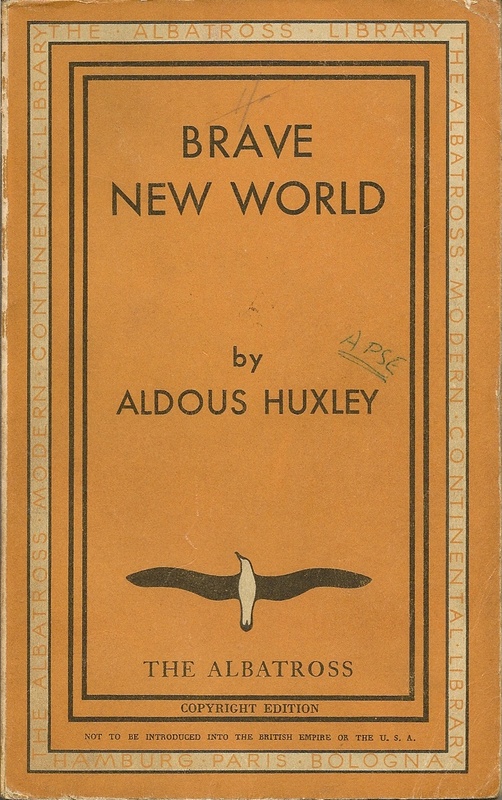 Suppose there were initially 1,000 paperback copies of the first printing that were not bound by their owners. A half-life of 20 years would leave 500 after 20 years and around 30 after 100 years. Is this a reasonable estimate of how many paperback first printings might remain of a typical Tauchnitz Edition published around 1912? After 170 years (the age of the earliest Tauchnitz editions), the number would be down to about 3 remaining copies of each book. Taking all the first 100 titles together, Todd & Bowden were able to locate early paperback copies (first printings or close to this) of just 10 of them, although this may partly reflect that the collections they reviewed were mostly in libraries, which tend not to like paperbacks much. I've put more emphasis on paperbacks in my collecting, but still I have first (or very early) printings of fewer than 20 of these first 100 titles, several from a single source. There are no doubt others out there waiting to be found, but between 0 and 5 remaining copies of each book doesn't sound way out. Once the numbers have fallen this low it becomes a question of whether any can be safely archived in collections or libraries, so that hopefully the process of decay can be arrested, or at least slowed down. For bound copies, an initial number of 1000 and a longer half-life, say 30 to 40 years, would leave 20-50 copies of each of the oldest books. Where there were later printings that are indistinguishable from the first printing once the book is bound, there would of course be more. Again these numbers don’t sound too far away from reality to me. The numbers offered for sale in the second hand book trade might suggest they are more common than this, but many of the books described as first printings are a long way from being so. Following on from the discussion below of Bernard Shaw’s plays in Tauchnitz, I’ve recently come across a copy of a Shakespeare play in the Shaw format. Although undated, I assume this is pre-war and the colophon of ‘Printed by Oscar Brandstetter, Leipzig’, suggests not earlier than about 1936. 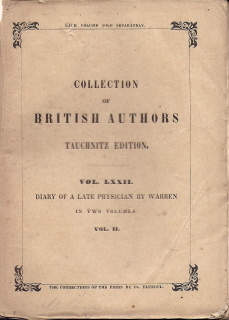 The setting of the text appears to be unaltered from that used by Tauchnitz for several decades, but the 1868 date has finally disappeared from the title page. I can’t find any reference to this format in Todd & Bowden, and as I’ve never come across one before, I assume it was not produced in anything like the quantity of earlier printings of Shakespeare plays. Maybe it was only introduced just before the war, and so little used. Did all the individual Shakespeare plays appear in this format? There’s also an intriguing reference on the rear cover to “separate editions of ‘Sonnets’ and ‘Poems including Sonnets’”. The only separate Tauchnitz Editions of these that I’m aware of are those issued during the First World War. Could these still have been on sale twenty years or more later, or had new editions been published? 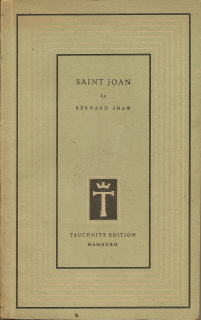 The Tauchnitz Students’ Series published in Hamburg from 1948 to 1950, was effectively continued from 1952 onwards by the Brandstetter Verlag in Wiesbaden, with the Tauchnitz name gradually disappearing. 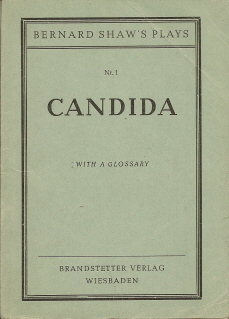 Most of the first 12 volumes were reprinted under the Brandstetter imprint, with other new titles also added, up to at least number 20. Most of these cannot be considered as Tauchnitz editions, but Todd & Bowden identify one main students’ series volume and three special volumes (Sonderbände) that carry at least some mention of Tauchnitz, and so are accorded the privilege of inclusion in their bibliography. The three Sonderbände are all Bernard Shaw plays and are classified by Todd & Bowden as a separate mini-series (U1 to U3). 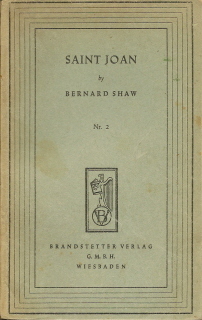 This parallels the earlier Students’ Series from the 1930s, where Shaw’s plays had their own mini-series rather than being included in the main series, apparently because Shaw objected to specific students’ editions. 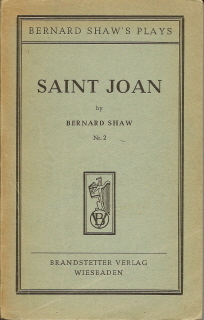 Todd & Bowden were unable to locate a first Brandstetter printing of volume 2 ‘Saint Joan’, but on the evidence of volumes 1 and 3 in the series, ‘Candida’ and ‘Pygmalion’, they surmised a common format for the three volumes, with wrappers headed ‘Bernard Shaw’s Plays’. On the evidence I can find though, which now includes various printings of the three volumes, there was probably never a fully consistent format. 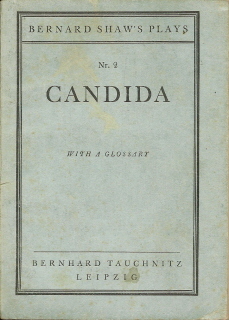 ‘Candida’ and ‘Pygmalion’ are in a format very similar to the Shaw series from 1931 and ‘Candida’ in particular, which appeared in that series, could easily be mistaken for the earlier printing. 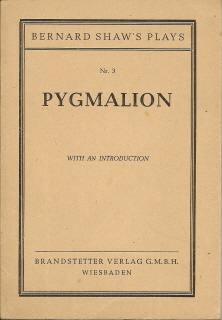 ‘Pygmalion’ is in a similar format, although the wrapper colour is more like that of the other students’ series volumes from the 1920s and 1930s. 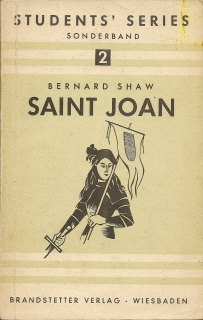 All the printings of ‘Saint Joan’ that I’ve come across though, are in a different size and shape, and the wrapper design of the first printing appears to be derived from the Hamburg edition of 1947 rather than from the 1930s series. It did move to something of a cross between the two series in later printings, and seems to have been reissued regularly in this format in later years, before appearing in a more modern style by 1965. Right from the start, Tauchnitz books carried advertising for other Tauchnitz books, on the covers as well as sometimes on internal pages. Later on, catalogues of various kinds were inserted, as well as advertising bookmarks and leaflets, and then separate free catalogues produced that were almost the size of the books themselves. So Tauchnitz were well aware of the value of advertising and marketing. But they almost never carried any advertising for companies other than themselves. 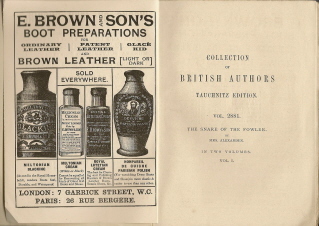 So it’s a bit of a surprise to come across a small number of Tauchnitz paperbacks carrying advertising for shoe polish, and meat extracts. 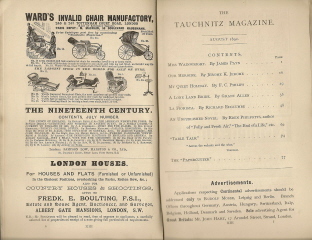 They appear to be limited to a handful of issues around 1892 / 1893 and be linked to the launch of the Tauchnitz magazine. The magazine, like most other similar magazines, carried extensive advertising, and for this purpose Tauchnitz appointed as advertising agents, Rudolf Mosse in Leipzig and Berlin, and John Hart in London. 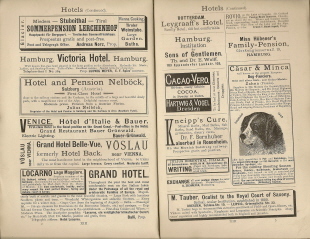 A high proportion of the adverts were for hotels in Europe, presumably reflecting the sale of the magazine to travellers on the Continent, but there were others for, amongst others, an invalid chair manufacturer and a supplier of dogs to the crowned heads of Europe. Was it perhaps Mosse or Hart who suggested to Tauchnitz that they could also supply advertisements for the books as well as the magazines? Whoever it was who took the initiative, the magazine launched with adverts in August 1891, and the earliest book I have seen carrying similar adverts was in September 1892. They lasted only for a few months through to February 1893 and then seem to have stopped. Perhaps the most intriguing adverts are for other publishers. There are adverts for both the Society for Promoting Christian Knowledge (SPCK) and for George Allen. The first of these includes in the books listed, ‘Jackanapes’ by Mrs. Ewing, already published by Tauchnitz several years earlier, and the second a series of works by John Ruskin, none of them at that time published by Tauchnitz, although two would be later. 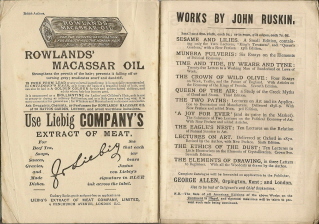 There can’t be many examples of publishers including adverts in their books for versions by other publishers, of books they published themselves. 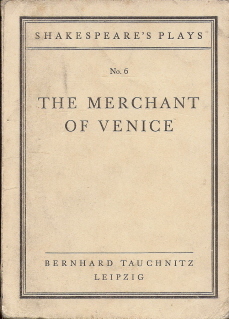 For much of the first 70 years of their existence, Tauchnitz were the dominant producer of English language books in Continental Europe. There were many other publishers who tried to break their dominance, but few had much success really until the First World War. The more or less enforced absence of Tauchnitz from the market for 4 years then allowed at least two other series to flourish briefly, but neither lasted for long after the war. So the rise of Albatross in the 1930s and its success in taking so much of the market from Tauchnitz was a considerable achievement. They were believed to be the forty-third known rival of Tauchnitz, but the first to really succeed, to the extent that they effectively took over the ailing Tauchnitz in 1934, just two years after their own launch. Todd & Bowden give little credit to the achievements of Albatross and are particularly scathing about John Holroyd-Reece, one of its two key managers, accusing him of ‘systematic manipulation’, ‘gross malfeasance’ and even ‘outright thievery’. Fortunately Holroyd-Reece’s reputation has been restored by work done more recently by Alistair McCleery, who also gives appropriate credit to Max Christian Wegner, who had briefly managed Tauchnitz before being dismissed by them and going on to found Albatross with Holroyd Reece. 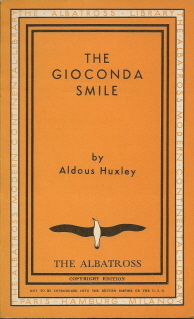 Perhaps the key element overlooked by Todd & Bowden, but researched in detail by McCleery, was that the rise of the Nazis in Germany in the 1930s not only restricted what could be published there, but was a particular issue for Albatross, owned by Sir Edmund Davis, who was Jewish, and partly run by Holroyd Reece, whose father was a German Jew. In this context their achievement was all the more remarkable. I hope on this website to redress the balance a bit and give Albatross some of the prominence that they deserve, starting with an Albatross page to be created shortly.